I leave a white and turbid wake; pale waters, paler cheeks, where'er I sail. The envious billows sidelong swell to whelm my track; let them; but first I pass. Yonder, by ever-brimming goblet's rim, the warm waves blush like wine. The gold brow plumbs the blue. The diver sun- slow dived from noon- goes down; my soul mounts up! she wearies with her endless hill. Is, then, the crown too heavy that I wear? this Iron Crown of Lombardy. Yet is it bright with many a gem; I the wearer, see not its far flashings; but darkly feel that I wear that, that dazzlingly confounds. 'Tis iron- that I know- not gold. 'Tis split, too- that I feel; the jagged edge galls me so, my brain seems to beat against the solid metal; aye, steel skull, mine; the sort that needs no helmet in the most brain-battering fight! 'Twas not so hard a task. I thought to find one stubborn, at the least; but my one cogged circle fits into all their various wheels, and they revolve. Or, if you will, like so many ant-hills of powder, they all stand before me; and I their match. Oh, hard! that to fire others, the match itself must needs be wasting! What I've dared, I've willed; and what I've willed, I'll do! They think me mad- Starbuck does; but I'm demoniac, I am madness maddened! That wild madness that's only calm to comprehend itself! The prophecy was that I should be dismembered; and- Aye! I lost this leg. I now prophesy that I will dismember my dismemberer. Now, then, be the prophet and the fulfiller one. That's more than ye, ye great gods, ever were. I laugh and hoot at ye, ye cricket-players, ye pugilists, ye deaf Burkes and blinded Bendigoes! I will not say as schoolboys do to bullies- Take some one of your own size; don't pommel me! No, ye've knocked me down, and I am up again; but ye have run and hidden. Come forth from behind your cotton bags! I have no long gun to reach ye. 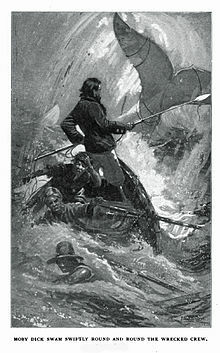 Come, Ahab's compliments to ye; come and see if ye can swerve me. Swerve me? ye cannot swerve me, else ye swerve yourselves! man has ye there. Swerve me? The path to my fixed purpose is laid with iron rails, whereon my soul is grooved to run. Over unsounded gorges, through the rifled hearts of mountains, under torrents' beds, unerringly I rush! Naught's an obstacle, naught's an angle to the iron way!